The takeaway: Pricing is information. When information is missing, the price of something may be unfairly high. When information becomes prolific, prices fall, making margins unfairly thin. The only business defenses in our world of increasing information are either to quicken the pace of innovation (to move into areas where pricing information is unknown), or seek to cloud information to protect pricing. So we cracked the cover to The Road to Serfdom by F. A. Hayek (bear with us, folks) and were reminded of the basic economic concept that pricing is a form of information transfer. Markets, you see, do more than move goods and services around to pay people money; they are actually collective hive minds of intelligence, transferring data on the relative value of things. Which brings to mind the painful choice of extended warranties. You know, if you bought any big electronics for Christmas, the dissonance of being pitched a warranty by a slick salesperson. Part of you thinks you don’t need it; another part worries, well, a neighbor’s kid could throw a chair through that flat-panel TV, so maybe, yes? Shouldn’t exist? Well, yes. Most markets have enough competition that a $2 product priced for $20 won’t stay alive for long; but a few don’t. In the case of warranties, strange services offered only after you’ve purchased something else in the dark of an electronics store with little competitive information to guide you, the absence of knowledge allows margins to float to the sky. In this case, the friction that blocks comparative value data from competitors creates a sticking point of artificially high margins for the one company pitching the warranty. We don’t mean to disparage the warranty industry; rather, simply to warn that price gouging of any kind always comes home to roost. Thaler calls this the point when consumers enter a “rip-off” stage of awareness. Healthcare is another vivid example. One could easily suggest the current debate over health reform is the angry reaction of a populous (or at least the liberal side of it) that has awoken to find skyrocketing medical costs are gouging society. Healthcare is really just one example of a broken competitive market; consumers don’t pay the bills, insurance companies do, and the individual who receives care has no idea what the procedure, tests and physicians are actually charging. 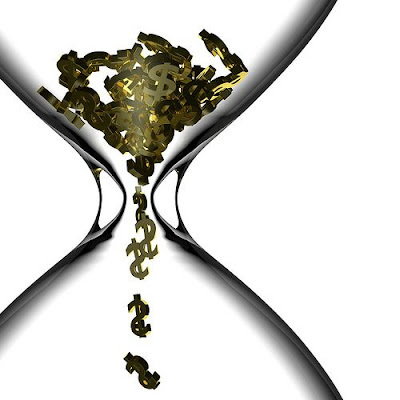 No information, no price competition, no check on rising costs. Really, this push-and-pull is the entire competitive market at work. Companies of all stripes try to disguise their margins in order to raise them. Seeking profits is healthy, because the motive leads to growth and innovation. Yet those goods that are priced too high due to an absence of information will be forced to slide back to reality. As our new tools make value data more transparent, margins will be harder to come by. Competitors will have to respond by either increasing the pace of innovation, or finding new ways to cloud their value. Good luck, and watch out for that guy looking at televisions in Aisle 9 with a cell phone. This is a story about how holiday sales don’t really exist, but that’s OK, because you need the fiction to survive. Communications designer and caffeine addict Hal Thomas found this classic Camel cigarette ad in a July 1952 edition of Life magazine. Ethics aside (for the record, our agency does not work with tobacco companies and has led anti-smoking campaigns), it reminds us of the basic strategy of framing value for your customers. If you have ever bought something on sale, marked “40% off” a higher price, you’ve been the recipient of framing. All those red tags with discounts in this holiday shopping season are simply attempts by marketers to follow Richard Thaler‘s advice: “frame” the price against another benchmark to convince consumers they’re getting a good deal. Why do people insist on this? It’s human nature. We all tweak communications in a way to make them more appealing to the recipient. If you call home late from work tonight, you will likely explain you’re on deadline or stuck in traffic (late due to outside forces, beyond your control, not really such a bad thing). The message arrives inside a context, and if we set the context appropriately, it sounds better. The dissembling tactic likely has an evolutionary benefit; no one survived in the wild by collecting all the data carefully and analyzing it — a wild lion would eat you before you ran the odds of where to run — so we had to make snap decisions based on what others told us about our environment. Comparing options to other choices also helped humans evolve; the caveman Ooga might not have been handsome by today’s standards, but if cavewoman Booga thought he was the hottest in all the tribe, she passed on the best genes. Or — in the most obvious framing device of all — how is that fictitious number with zeros after it in your bank account doing lately; is the personal score we call “money” moving up or down? So here’s a provocation for your marketing team’s next meeting: Explore all the ways you can compare your product attributes to something else to make it more appealing. Tactics include communicating discounts from other price points (think clothing sale), or bundling your product in an unusual configuration (think candy boxes at movie theaters or auto dealer option packages), or even framing it against other brands (Coke vs. Pepsi). If you focus on the product itself without putting it in context, customers may not get what you mean … or want what they’ll get. Communications designer and caffeine addict Hal Thomas found this classic Camel cigarette ad in a July 1952 edition of Life magazine. Ethics aside (for the record, our agency does not work with tobacco companies and has led several anti-smoking campaigns), it reminds us of the basic strategy of framing value for your customers. If you have ever bought something on sale, marked “40% off” a higher price, you’ve been the recipient of framing. All those red tags with discounts in this holiday shopping season are simply attempts by marketers to follow Richard Thaler‘s advice: “frame” the price against another benchmark to convince consumers they’re getting a good deal. Customers, as we’ve written before, are bad judges of value. We don’t know what a diamond should cost — but if the engagement ring is $3,000 marked down from $5,000, it feels fair. We’ll pay $3,000 perhaps if we see an illusory $2,000 above it in “savings,” even if that higher price point never really existed. 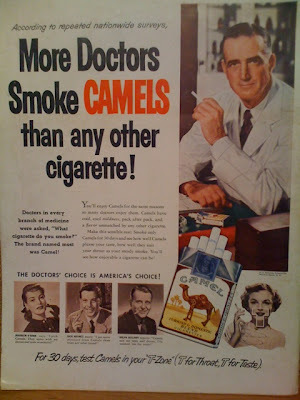 This old Camel ad does the same thing to consumers of the 1950s, framing a cigarette choice as a safer alternative by juxtaposing it against images of doctors. Businesses fall for this all the time, too; take the marketing director who demands “30% in value-add” from any media buy; she’s really getting the same amount of media, but feels better because the vendors restructure the pricing of ads to give “some” away for free. Why do we do this? It’s human nature. We all tweak communications in a way to make them more appealing to the recipient. If you call home late from work tonight, you will likely explain you’re on deadline or stuck in traffic (due to outside forces, beyond your control, not really such a bad thing). The message arrives inside a context, and if we set the context appropriately, the message sounds better. The dissembling tactic likely has an evolutionary benefit; no one survived in the wild by collecting all the data carefully and analyzing it — a wild lion would eat you before you ran the odds of where to run — so we had to make snap decisions based on what others told us about our environment. Comparing options to other choices also helped humans evolve; the caveman Ooga might not have been handsome by today’s standards, but if cavewoman Booga thought he was the hottest in all the tribe, he and she passed on the best genes. You’re beautiful is nice. You’re the most beautiful person in this room is so much better. So here’s a provocation for your marketing team’s next meeting: Have you explored all the ways you can compare your product attributes or costs to something else to make it more appealing? Tactics include communicating higher price points now X% off (Talbots sale), or bundling your product in an unusual configuration (candy boxes at movie theaters, or those collections of food items from Omaha Steaks), or even framing it against other brands (Coke vs. Pepsi). If you focus on the product itself without putting it in context, customers may not get what you mean … or want what they’ll get. Brand strategist Martin Bishop kicked off an interesting debate on methods to defend the price of luxury goods in a lousy economy. Some commentators suggested marketers who discount luxury brands are showing a sign of weakness. It is not true that if consumers require a price cut, marketers have not done their job. Economist Richard Thaler noted decades ago that consumers require price framing — a reference point by which they can determine if they are getting a good deal. Every product really has two prices, a usually higher mental “price A” by which you judge the value, and the “price B” you pay. If consumers judge the difference to be positive, they feel they get a good deal; if the difference is negative, it appears to be a “rip-off” situation. Talbots is a luxury clothier that uses price framing brilliantly — a $120 sweater is expensive, but if it is marked down 40% from $200, the woman shopper thinks she’s found a bargain. Marketers have always played this game, in many ways — not always using discounts. Luxury goods seek to disguise the price differential by obscuring the first reference price. Gee, a diamond costs $3,000? Well, that could be a good deal, because as a consumer I do not have transparency into what the reference price is. Obscuring the reference is a common pricing strategy — you can do it with luxury branding (a Lexus costs more than a Toyota even with most of the same components) or with simple variations of bundling (think of Omaha mail-order steaks which include free knives and add-on packets of food). The story here is that consumers are bad at judging value, and so typically look for a reference to see if their deal is better or worse. Luxury brands disguise negative value for consumers — the fact that consumers are paying a very high surcharge for a product or service really not worth that — by clouding the reference price. In a down economy, the mask begins to fall off. 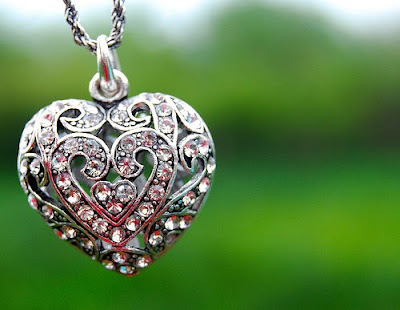 Diamonds that have been positioned as $3,000 icons of love that last forever begin to look more like shiny pieces of carbon. It’s not that marketers are doing a worse job; but rather outside inputs of information — news about the economy, fear that one may lose her job — create a new level of awareness that helps consumers figure out the “real” reference price. The bottle of perfume that costs $80 suddenly looks like scented water worth 80 cents. In times of caution, consumers in essence open up their judgment inputs to more sources of information, like deer hunted in the wild. This heightened sensitivity gives them a better fix on the real value of the product. All of which is saying, yes — luxury brands will take a hit, as the illusions they present on the reference price wear off. Discounts on luxury goods are not a bad strategy — the dismal market is going to force brands there anyway — so instead of fighting downward price pressure, try new ways to control the perceived spread between the reference price and reality. Coming soon: $4,000 diamonds now 33% off. For the first time in 70 years the price of most goods is falling significantly, creating a thorny tangle of “deflation” for marketers. You see, your customers don’t like to buy stuff today when they believe the same stuff may cost less tomorrow. How should advertisers react? By reframing the price. Here’s an example: Say you’re in the business of selling tickets to dancing elephant events, and the price of admission is $120. The typical elephant fan in the past comes to three such events a year — so the total cost is $360. In a down economy, consumers may retrench. So reframing the price might include moving it to a subscription model — sign up for a season pass for a monthly fee of $30! — or using artificial discounts. – Optimize margins — by strategically deciding whether to sell fewer products at higher margins, or more products at lower prices. If the market won’t bear high prices, you may need to move down a step and shoot for scale. – Create a reference price — an artificially high price that you then “discount” beneath. Retailers such as Talbots use “40% off” deals to show a perceived value that really does not exist. – Obscure the reference price — make it difficult for a buyer to discern the real cost by bundling in other items or services. Toyota does this brilliantly when you buy a minivan that includes numerous packages, until you just can’t figure out the real sticker. – Segment your customer base and charge variable prices — increasing prices for some customers seems damned unfair until you realize most of the world does this. Supermarket coupons are a perfect example, where your Aunt Millie buys a can of soup for 50 cents while you pay the full buck. You’re both getting the same soup, but at different prices. Campbell’s makes more money off you because you are less price sensitive than your coupon-clipping aunt. – Explore subscription or extended payment models — You can help customers manage their bills by reducing spikes in payments. Utilities do this with monthly payment plans; can you? – Bash the competition — If you ever thought someone else was charging too much, this is the economy in which to shout about it. See McDonald’s slamming Starbucks. We bet customers will respond. If pricing strategy is not on your task list for January, jot it on the whiteboard and get going. Read Richard Thaler, the economist who wrote the book on the psychology of price framing. Your customers are waiting for a better deal.